May 2017 mortgage interest rates started off choppy but have since started trending higher. With Geopolitical concerns somewhat quelled, I expect mortgage interest rates to continue to rise in June 2017 with anticipation of a FED rate increase in June. Fairway Independent Mortgage and Team Green is your ideal lender for refinance and purchase transactions in Arizona, Maricopa County, California, Colorado, Washington state, Georgia, and Indiana. 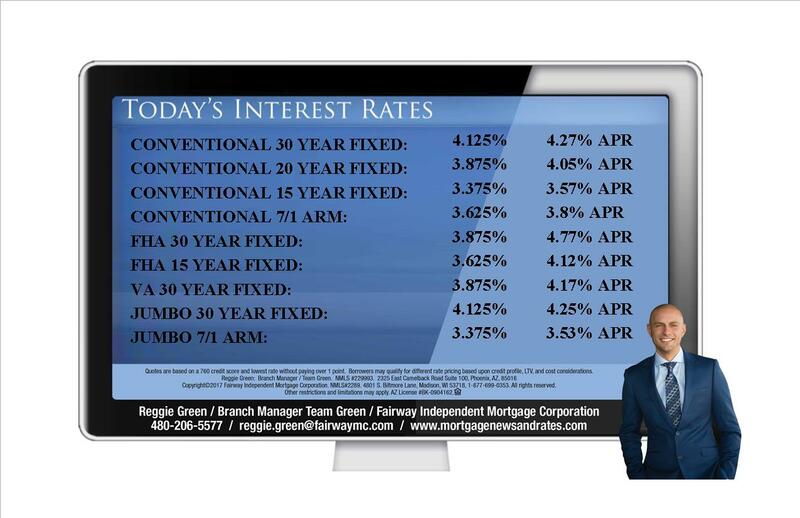 Team Green and Reggie Green are ranked as one of the top mortgage bankers and lenders in Arizona.